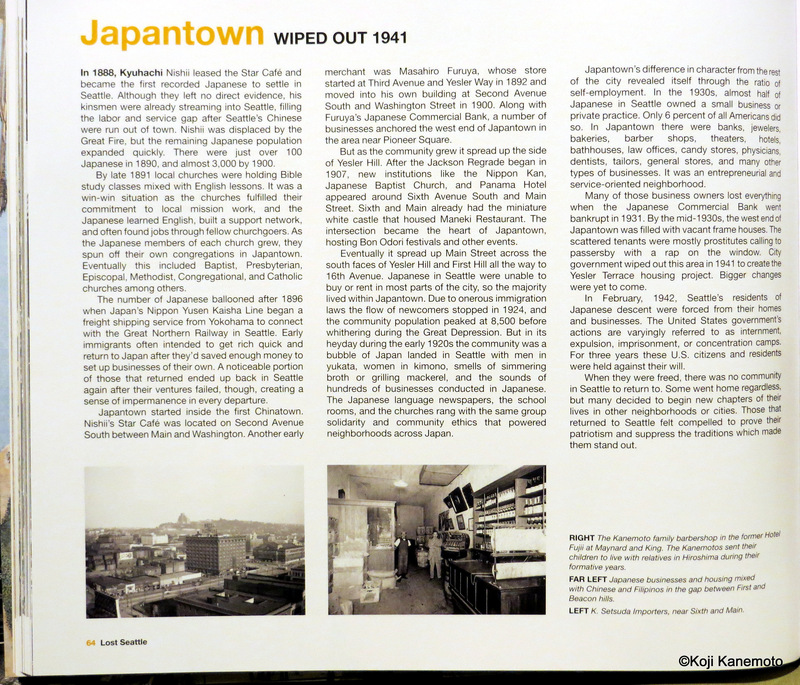 Eighty years or so after he posed for a photo, my Grandfather Hisakichi is in an American book. Standing “Marine-esque” in his Seattle barbershop. I had come to know Rob Ketcherside from flickr. We had helped each other out looking at some old photos he had of Seattle – where all my aunts and uncles were born (except one). He had some fascinating tidbits on some of my Grandmother’s photos. Well, it turned out he was an author. 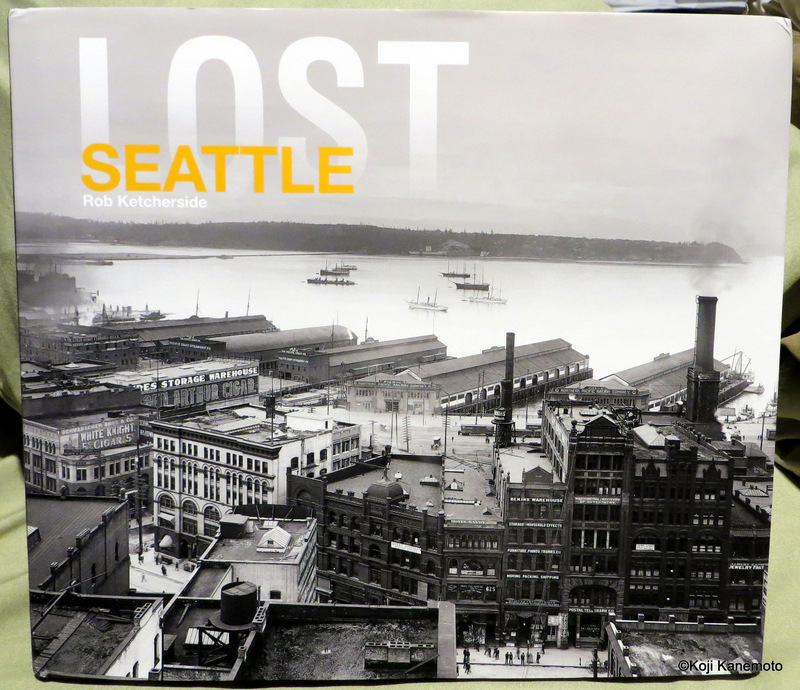 He had been doing a ton of research into “lost Seattle” – skylines and communities now long gone. With his fascination for “what was” (me, too! ), those sights are now basking in sunlight once again through this mesmerizing book. 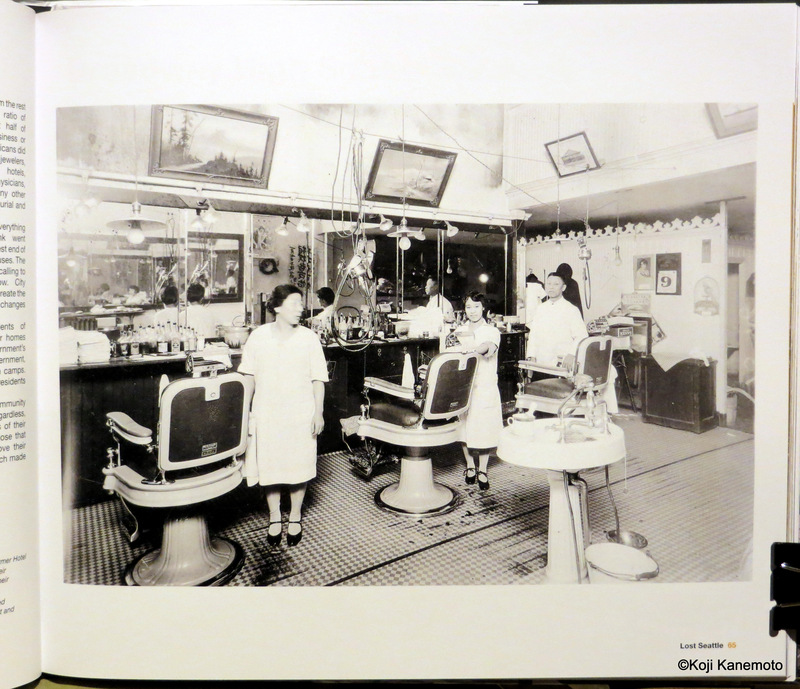 It was boosting to me when he asked if he could use one of the family’s vintage photos in his book; specifically, the photo of my grandfather’s barbershop. It is on loan to me from my cousin Masako (yes, the Masako after whom my blog is named) who luckily kept these family treasures all these years. It is more wonderful in that the home in which the photos were in survived the atomic blast – as did my family. I hope Rob (and his publisher) don’t mind a couple of pages of his book are shown herein…and I’ll be picking up a few more copies to take back to Hiroshima in a few weeks. In the description below, Rob also mentions Masahiro Furuya and his business. As it turns out, both my dad’s oldest brother Yutaka and his best friend John Tanaka worked for Furuya… And yes, that is the same John Tanaka my Aunt Shiz married. Small world, yes? Actually, Uncle Yutaka was the matchmaker. Grandfather is standing at the right-rear of his barbershop. And the photo is a full pager in Rob’s book! Cool! Grandfather should be pleased. In the original print, you can see the brand names of the hair tonics popular at that time. The gal in the middle was quite a cutie, too. I wonder what happened to her. If she was still there in Seattle when war broke out, it is likely she went to the same prison camp my dad and uncle were incarcerated in. On an interesting note, the consensus is the calendar shows January 9, 1930. In concert with Rob’s massive research effort, gone is my father’s precious Hotel Fujii and my grandfather’s pride and joy barber shop. It was demolished to make room for “Hing Hay Park” taking its place. 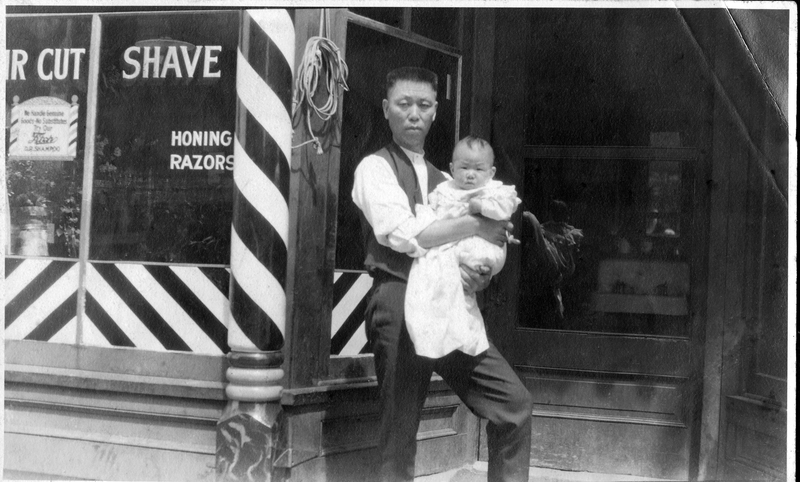 Grandfather Hisakichi holding Aunt Shiz in front of the barbershop. Circa 1918. 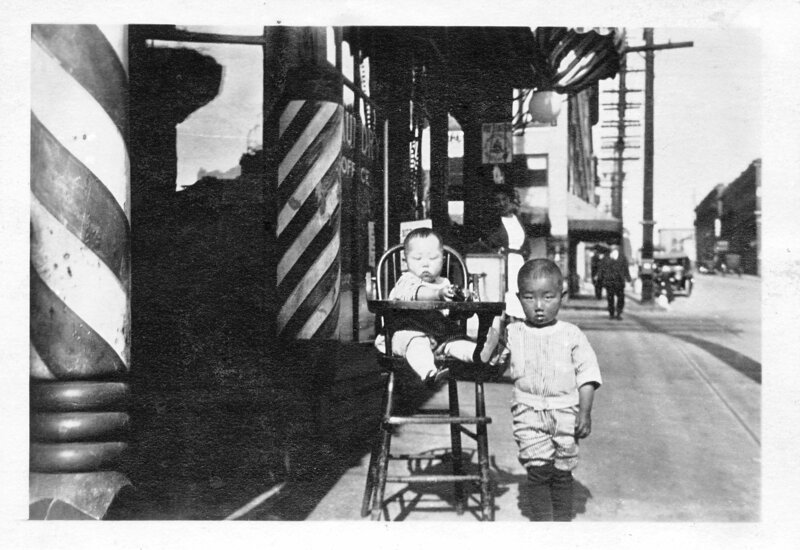 Dad on right with his youngest brother Suetaro in front of the barbershop (circa 1922). 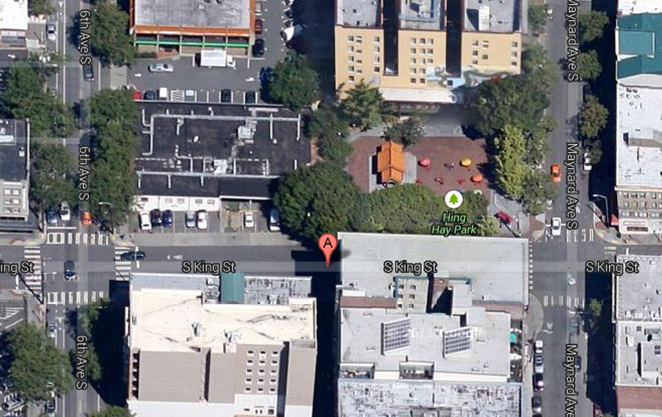 They are likely standing where the label “Hing Hay Park” is on the map above. As readers know, Uncle Suetaro was killed as a Japanese soldier by the US Army on Leyte on July 15, 1945. Dad was imprisoned in Minidoka, ID at the time of his death. 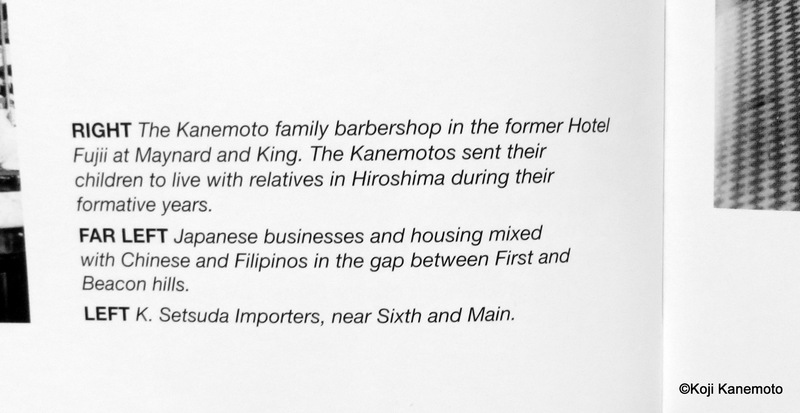 And like the barbershop and Hotel Fujii, my dad is the last one standing out of seven siblings and two courageous grandparents. I kinda wish my grandparents could have seen this. How lovely to see your family’s photo in that book. Bet you’ll be taking a few copies of it when yon go to visit. It must have been a great experience to help rob out with his research too. Congrats. Isn’t it a thrill to know a member of your family will forever be remembered! I know, some days my eyes just sting and water. This is wonderful Koji! I wish your grandparents could see it as well. What’s wonderful is that all of the descendants will continue to remember your family and their history. Thanks, Chatter Master. I hope they do take a look once in awhile. It would make our ancestors pretty happy. Old pictures bring people alive. Nice tribute to your ancestors through those pictures and your posts about them. You, sir, do some fantastic research yourself! As usual, I am buried with life’s daily grind… I need to keep catching up with all the great stories on WordPress – including yours in both English and French! Indeed you do, Curt. I know I missed a few of your “Peace Corps” battles and am striving to somehow catch up with everyone’s stories. If I only have 25 hours a day…which will be next weekend! 🙂 The story of yours about the “Temple of Whollyness” was real moving…and with a very ingenious title. Koji – How very exciting for you and your family !!! Old pictures really help us connect with the people that came before us. I just received a bunch of photos my Uncle Ced took when he was 17 and on a “Coming of Age” hHitchhiking trip to Chicago and Wisconsin to visit his late mother’s family. I can’t wait to read all those letters. Yes, we both love the glimpses into life styles passed, don’t we? I also can’t wait to see some of the photos taken by your uncle! I’m doing my best to catch up…! How wonderful to have the photograph. Is your dad still around? Well, hello! Yes, my dad’s still around; he’ll be 96 next month. He can’t remember what happened ten seconds ago but he’s still here. The man in the barbershop is his father. Thanks for stopping by! Lovely. 96! My grandfather will be 95 this year, so I know what you mean about the memory.